I'm going to summarize my impressions and thoughts over last evening's show in Luxembourg. To be honest, it didn't quite live up to it's hype. Then again, what does? Ken Sommer and Brian Nygaard had promised a "spectacular show", "American style" - that didn't happen. It was something new, that's for sure and well orchestrated indeed, but the roof was never on fire. The team managed to present themselves professionally and the roster is indeed impressive. That is the most important matter. An exciting mix of older, experienced riders like O'Grady, Bennati, Voigt and Cancellara, of course there is the Tour's runner up Andy Schleck and his brother Fränk, as well as younger riders with promising futures ahead. The fact that Brian Nygaard apparently had hired half the cirque de soleil to perform during the show, didn't quite do it for me but proves that the team is not afraid to do things their way. I like that in a team, to do their best to be different, establish a rhythm of their own. The flip side of that coin is that the higher the expectations, the higher the fall. Just ask Team Sky which many believe failed to live up to the expectations given prior to the season. This was just a show, remember? The team's roster is very robust and will be a force to follow in the season. What surprised me the most is the visit from Pat McQuaid, I can't recall seeing McQuaid at any other team presentation before. That said, it might have happened, I've been mistaken before. It doesn't matter if he got invited by Nygaard, Luxembourg Cyclist Federation or the Prime Minister himself; the signal effect is significant. There are great riders on the team, and I find it super that McQuaid has taken his time to be with riders, staff and others in the industry, but then he must do so to every team. Time will show. He also said that something like: "...this team has everything cycling is proud of". At the same time Kim Andersen, the leading DS, was present among the team's staff. There has been some controversy regarding Kim Andersen amongst people connected to the industry lately, due to him being one of very few in cycling tested positive five! times in his career as a cyclist. Earlier yesterday, the Schlecks, Cancellara and Flavio Becca took the opportunity to meet and greet with the Prime minister Jean-Claude Juncker, even offering him a jersey. Mr. Juncker also showed some sportsmanship trying the jersey on. There were rumours that the team was partial backed financially by the Luxembourg state, but I have not been able to confirm that. The Schlecks, Luxembourg Prime minister Juncker, Fabian, Lucien Lux and Investor Flavio Becca. 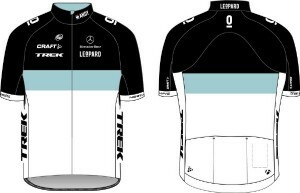 Sponsor Trek is rumoured to put in 3 million € in total which should give the team a good start along with Becca's cash. Mercedes, energy company Enovos, Luxair, Shimano, Speedplay and Schwalbe are the other sponsors. This should indicate that the money will come from Becca, Enovos and Trek, while the rest supports with gear only. That helps enormously though. For more about how the team started check this Velonation article here. Still it is a bit strange that Becca being a businessman, apparently does not want to promote his own company in the team name. However, he's been given a fair amount of marketing time already with the team and it will probably just be more. The clothing is quite simple in a good way that is, at least to me. Nothing spectacular there. Reminds me a bit of Sky and Garmin, but it's definitely not as Sky-ish as Garmin's. Don't know if the names and flags on the collar is going to work for the fans watching on TV or by the road but a lot can happen during the season with regards to R&D.